What a great lesson—a lesson that is as relevant to adults as it is to children. In fact, I know a couple of gentlemen who should have taken this lesson to heart. I have always loved basketball at all levels—especially the National Basketball Association, commonly called the NBA. On Saturday night, Los Angeles Clippers’ owner Donald Sterling purportedly made some harsh racist remarks. I was stunned. For years, Elgin Baylor, an African-American, served as the Clippers’ club president. The Clippers’ current coach is Doc Rivers, another African-American. And, of the twelve-man Clippers’ roster, ten are African-American. How can that be? How can someone who lives in the sports world and who gives the appearance of being tolerant say such things? The answer is easy. He is a racist. Maybe a closet racist, but a racist, none the less. As this story continues to develop, there may be other explanations. For example, Donald Sterling claims he had authorized his ex-girlfriend to make this recording because he feared he’d forget what he’d said. But now he says she altered the recording. However, more and more facts have immerged regarding Sterling’s racism including preventing non-whites from living in his rental apartments. Since this story broke, I learned that Elgin Baylor had filed a lawsuit against Sterling and the team over his old contract. The same is true of several other of his former players and coaches. Sterling has chosen to fight them in court rather than honor their respective contracts. Now Doc Rivers, one of the best coaches in the league, must coach his team, the Los Angeles Clippers, under adverse conditions brought about by the owner of the team. Coach Rivers is contemplating his future with the club. About ten years ago, I had the pleasure of meeting Doc Rivers. He seemed like a gregarious gentlemen. He let some of my AAU basketball kids take pictures with him. What a day for my team! But here and now, Doc Rivers, a splendid ambassador for the game of professional basketball, is being put through unnecessary drama and negative attention. During the Clippers game on Sunday, the team turned their uniforms inside out during warm-ups—a silent but brilliant protest of Sterling’s evil words. But clearly their heads were not in the game. Can you blame them? The new commissioner of the NBA, Adam Silver, says he is investigating Sterling’s racist remarks and is expected to quickly address the situation. But I have to agree with Mike Greenberg of ESPN, who said that other than Michael Jordon and Earvin “Magic” Johnson, the owners have been silent on the racism displayed by Sterling. They have a platform and they are not taking advantage of it! Another racist in the news is Cliven Bundy, the Nevada Rancher whose recent dispute with the federal government over grazing rights culminated in a near armed confrontation that could have become much worse. Mr. Bundy’s ridiculous statements could clearly impact public perception of his case against the United States Government. Mr. Bundy demonstrates that if you put a microphone in front of someone over and over, eventually he’ll tire of reciting the same message and his true personality will slip out. As those kids learned, you can’t put the toothpaste back in the tube. If your heart is pure, then one does not have to fear words uttered in private or before a microphone, but should your heart hold hideous secrets, be aware that in today’s world of instant record that eventually your true colors will be exposed—especially the color of your soul. For those of you who were like me, fixed to every single development of the standoff between the United States Bureau of Land Management (or BLM) and the Cliven Bundy Ranch, I want you to know—it is far from over. The BLM swooped in and inflicted tyranny on the Bundy Ranch and the good citizenry for a total of three days, before they finally stood down. An interesting fact emerged toward the end of the conflict: US Senator Harry Reid’s son and a former staffer are in positions of authority in Nevada, and they may have been behind acceleration of this conflict, due to pending or potential business dealings. If true, is it related to this conflict? Let’s look at what started this confrontation. Mr. Bundy claims that his family has operated the ranch since in late 1800s, before the establishment of the BLM, and he does not recognize the BLM’s claim, due to his family’s continued occupation of this land. As of this date, Cliven Bundy has lost twice in federal court prior to these events, which began last Thursday. So in essence, going into last week’s confrontation, the federal government may—and I say may—have had the upper hand. According to various legal sources, all the federal government would have had to do is file a lien against the property, and let the lien process play out. It may be a conflict of interest to have the US Government rule on a dispute between a federal branch of the government and a US citizen, but I will leave that for legal minds to resolve. However, the BLM showed up with overbearing force, including some who may not have been solely BLM personnel, which included snipers. Not only did they threaten the Bundy family, they threatened the neighbors and protestors who showed up to defend the Bundy family. The BLM even went so far as to set up an area three miles from the Bundy Ranch for “1st Amendment Rights,” one of the most bazaar things I have ever heard. They threatened people with tasers, threatened people taking pictures of the snipers and of the BLM employees squatting down behind their vehicles pointing guns at the demonstrators. The contrast in the optics of the situation was clearly in the favor of the Bundy Ranch, the neighbors who road on horseback carrying the United States flag and the other protesters who showed up, who for the most part were well behaved. Quickly, this confrontation between the US Government and the people escalated into a very volatile situation. Moreover, when the BLM personnel were removing the cattle from the Bundy Ranch, some of the animals were mistreated, including the killing of two bulls. It has also been reported that some personal property of the Bundy’s was destroyed. Mr. Bundy has admitted he is behind on paying grazing fees. Now, I am left with several unanswered questions: If fees are due, to whom do they owe the fees—the US Government, or the State of Nevada? And do they really owe anyone? If fees were paid, when was the last payment made? What are the legal steps that either side had available to them, before this incident, and why were those steps not taken? What are the new legal steps that are now available as a result of this stand-off? Do you have answers? What questions have arisen in your mind, in light of this incident? Do you feel the US Government acted justly and appropriately in this case? Why, or why not? April 18, 1942, is a very important day in the history of World War II. On this day, Lieutenant Colonel James Doolittle launched his fighter-bomber group, consisting of sixteen B-25Bs in a six-hundred-mile bombing mission over Tokyo, Kobe, Nagoya and Yokohoma, Japan. The original plan called for Vice Admiral William Halsey to maneuver the US Navy fleet, so that the bombers, after dropping their bombs, could fly and join up with Chennault’s AVG Flying Tigers. This significant event was very important to the United States, as it was the first offensive mission against Japan after their attack on Pearl Harbor. However, the attack on Japan didn’t go exactly as planned. While the US Navy aircraft carriers Enterprise and Hornet attempted to slip undetected close enough to Japan to launch the attack, they were spotted by Japanese patrol boats. These eighty brave men immediate went to their back-up plan, launching some four-hundred miles earlier than planned, changing the already-dangerous bombing run over the enemy’s country to a ditching mission, after completing their bombing run. While they were told to spare the Japanese Imperial Palace, Doolittle himself buzzed the palace in his plane. Fifteen of the sixteen planes made it to China. The remaining plane made to the Soviet Union—our great World War II ally—where its crew was interned. Doolittle and his fighter-bomber group practiced their mission at Lake Murray, South Carolina, a recently constructed lake. 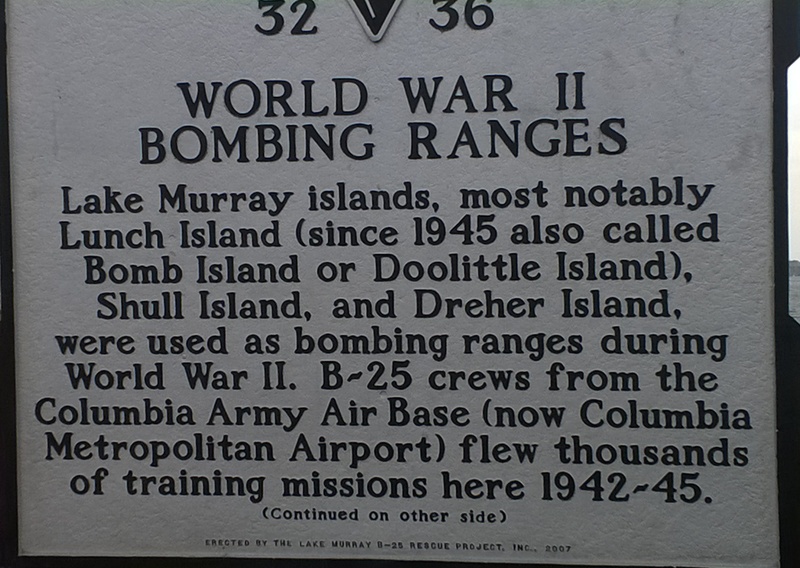 They practiced on Doolittle Island, Shull Island and Dreher Island, flying out of Columbia Army Air Base, which is now the commercial airport for Columbia. 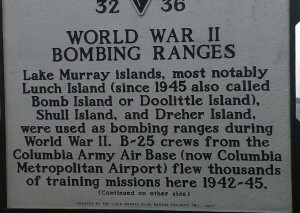 Following the raid, Doolittle’s B-25s continued to train at Lake Murray for the duration of the war. Sixty-four of these men continued to fly throughout the remainder of the war. While Doolittle’s raid did little damage to Tokyo, it gave the United States hope during a very dark time in our history and showed the Japanese that they were indeed venerable. Hirohito had grossly miscalculated that the United States would be willing to enter into peace talks after their six-month campaign throughout the Pacific. But Roosevelt and his Joint Chiefs had a different answer than the Japanese had anticipated. This surprise attack forced the Japanese to attempt to extend their defensive perimeter, which led to the Battle of Midway, ending their offensive war. Doolittle and his crewmen held annual reunions around the country, up until last year. They often came to Columbia, SC for these reunions, the last time being April of 2009. In 1956, Hennessy Distillers presented Jimmy Doolittle with a bottle of 1896 cognac, in honor of his birthday. Three years later, the City of Tucson present them with eighty gobbles (shot glasses) commemorating the airmen, thus starting the annual reunion ritual. Each living member would toast the mission, those who had passed and the remaining survivors. Last year, the four remaining living members celebrated with their last toast of cognac at Eglin Air Force Base in Fort Walton Beach, FL. One of the survivors was too ill to make the trip. How should we continue to honor these brave men from the greatest generation on their anniversary date this year? I recommend that a toast of cognac or our favorite adult beverage would be very appropriate, along with a moment of silence to commemorate their brave mission.